One Month into my quest for Shy Bladder Recovery, and where do I stand? I stand with a bunch of Successes, as well as an equal amount of Failures! I know I’ll have misses, disasters, and hiccups… But if I don’t let them derail my progress and lose hope, then I will eventually succeed and accomplish my goal: To Pee in a Busy Public Bathroom at a Urinal! Today, I’m out most of the day. I’m heading to Ikea (Love that store), and then eating at Flemings (Awesome Steak House). So before I leave the house, I pee 2 or 3 times, just to get it out of my system. The drive to Ikea is 45 minutes away, and it’s cold out (a brisk 25°). This doesn’t help my bladder any, and by the time I get to Ikea, I feel that I probably could pee (Not a great way to start out the day). Mike (my Pee Buddy) says he needs to pee too. He knows my situation and I’ve had plenty of deep talks about my condition with him. He does what he can to help. The last couple of days, I’ve been practicing simple things like entering public bathrooms and standing at urinals (with no inkling to pee), just to desensitize myself. This task is tough for me, since I’ve fought my whole life to avoid bathrooms and urinals. I’ve probably only stepped foot up to urinals a good 20 times in my existence. And since I’m desensitizing, that means I need to enter the men’s room and at least pretend I’m peeing. Just to get comfortable with the whole concept. We both head towards the Bathrooms! Mike goes up to the 3rd urinal (there are only 3), and I go up to the center urinal (the first urinal is a kiddy urinal). He gives me a crazy look like he can’t believe I’m doing this. Ha! I don’t want to bring attention to what I’m doing. Mike finishes, zips and goes to the sink. Now it’s just me in the center, great! I frown at this and try not to think about it. I’m sure it happens to everyone. Mike is drying his hands as someone enters and takes up urinal #3 (no one wants the short one). This guy pees quickly. I’m just standing there minding my own business. I’m playing mind games with myself seeing if I can actually pee or not. #3 guy pees and heads to the sink. I’m still standing there as Mike leaves and is now waiting outside. I know I could stand there longer, but the center urinal has me really on edge. I look at my watch and see that it’s been 3 minutes. TIME TO GO! I go to flush… and there is no flusher. It’s one of those automatic flushers that flush when you walk away. That’s bathroom #2 (and urinal #2) in my 3 bathroom quest this week. I unzip and stand there. I try to coax myself to pee. PEE PEE PEE! That’s when the bathroom door opens and someone else enters. I thought they’d come up to the urinals, but they don’t. They go to the first stall. I hear the door open, then close, then open and close, and then the guy goes back over to the sink ??? He goes out the door and I hear the bucket and mop rolling around. The guy in the stall is now out and washing up. I’m try to ignore them both and concentrate on going, but I can’t. I know I can’t go as long as he’s cleaning. So I give up and end my visit. I wash, dry and leave. Once again I glance at the family restroom as I walk by. After another cup of coffee in the cafeteria, I start to feel antsy. I keep a constant eye on the hallway. I watch guys come and go. Ikea is not busy like they usually are, which is weird for just a couple of days before Black Friday. I see the Employee with the Mop and Bucket leave. The area is empty. Nobody is coming or going… I decide to make my move and try to pee again. I head down the hall and enter the men’s bathroom. I’m the only one there! Sweet! 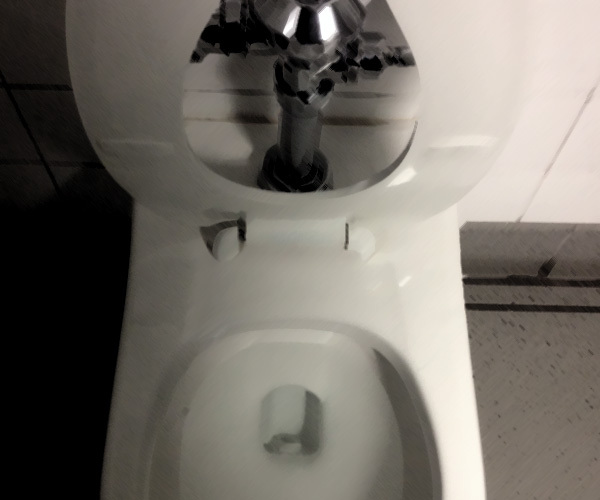 This time I take no chances (especially since I’ve already fulfilled my urinal quota for today), and so I allow myself to enter the stall to pee. I feel safer there and I know I can probably go. It takes me a good minute or two, but I finally urinate. This time I was the only one in there the entire time. You just never know! Afterwards, me and Mike finish shopping, and then we head to Flemings for an awesome Filet. Mike goes to the bathroom and tells me that I could probably pee in there. The bathroom is small, but the stalls are separate from the urinals and they are almost entirely closed in. But for some reason, even though I know I need to pee, I don’t feel comfortable peeing here. I would feel like I was on display walking by all those people outside the small bathroom… So what do I do? Right before we leave, Mike goes in and pees again. I tilt my head. He says there’s a lot of commotion in there. Some guy lost his contact lens and people are all over the floor looking for it. Plus, the stalls are full and there’s a line at the urinals. WTF? NOT GOOD! I could NEVER EVER pee under those conditions! Like I said, you just never know! So today, I went to the bathroom 3 times, and peed just once. Granted my goal was to just stand there and NOT pee, but still, if you DO have to pee, then it changes the entire scenario. It’s no longer a calm and observing desensitization. It’s now scary, uncomfortable, frightening and makes me panic. Everything is more difficult when you HAVE to pee and CAN’T! That’s why I’m going through these Gradual Exposure Steps. I’m trying to face my fears. I’m trying to alter a lifetime of bad feelings and behaviors. All I can do is take it one day at a time! So I have some successes, and some failures.